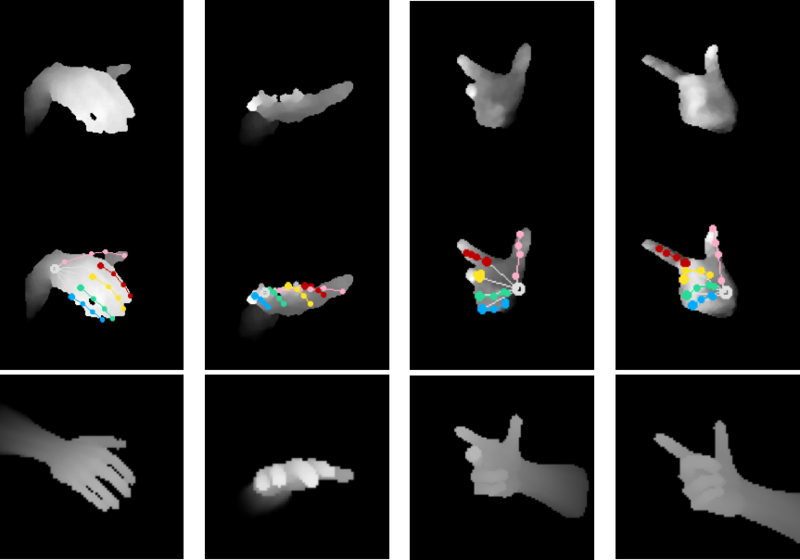 We propose a robust hand pose estimation method by learning hand articulations from depth features and auxiliary modality features. 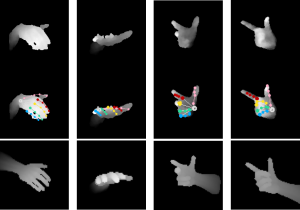 As an additional modality to depth data, we present a function of geometric properties on the surface of the hand described by heat diffusion. The proposed heat distribution descriptor is robust to identify the keypoints on the surface as it incorporates both the local geometry of the hand and global structural representation at multiple time scales. Along this line, we train our heat distribution network to learn the geometrically descriptive representations from the proposed descriptors with the fingertip position labels. Then the hallucination network is guided to mimic the intermediate responses of the heat distribution modality from a paired depth image. We use the resulting geometrically informed responses together with the discriminative depth features estimated from the depth network to regularize the angle parameters in the refinement network. To this end, we conduct extensive evaluations to validate that the proposed framework is powerful as it achieves state-of-the-art performance. Please click here to download our paper. Supplementary material is also available, click here to download.